In terrible news from this year's Giro d'Italia, popular Belgian professional racer Wouter Weylandt, riding for Team Leopard-Trek, crashed fatally on a high-speed descent 24 kms from the finish of today's stage. 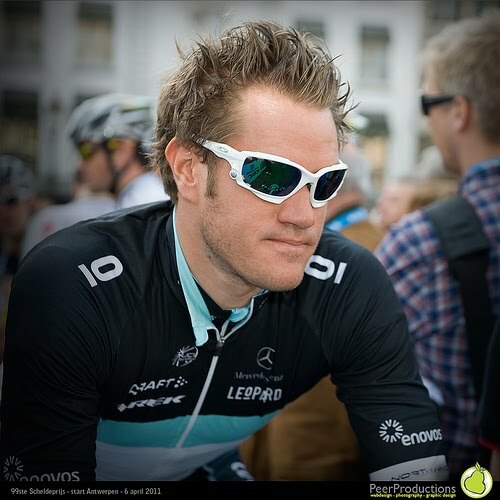 Wouter Weylandt, who won a stage during last year's Giro, became a professional in 2004. He rode for QuickStep as a teammate of Tom Boonen and was seen as a rising star in Boonen's style. I first read about him when he joined QuickStep as an impressive new prospect. A big handsome man with a professional attitude, he had already been visible animating this year's Giro. His tragic death at only 26 (and only four months away from becoming a father) comes as a shock and a sad reminder that the sport we love can be very dangerous and that we should all be as careful as possible out there. Of course, his loss to pro racing is but little compared to his loss to his family and friends and teammates and my condolences go out to them.